This is the most comprehensive reference book to date on the relationship of geocosmic signatures to reversals in the U.S. stock indices. It is written specifically for traders or analysts of U.S. stock and stock indices who wish to enhance their ability to identify critical reversal zones far in advance. 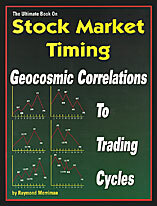 With this book, the reader will discover which are the most powerful and consistent geocosmic signatures to primary or greater cycles in the U.S. stock market. There is nothing like this book available today. The results are truly remarkable and will change the way you look at financial markets. This is a book that traders and market timers will refer to for many, many years. It is well written, understandable, and easily applicable. Along with Volumes 1 and 2, this book is destined to become the ultimate reference book on stock market timing.